Netpol has produced a short briefing for campaigners about private security personnel, their powers, the difference between security guards and bailiffs or high court enforcement officers and how you can make complaints about misconduct. The briefing is available to download [ , 377 kB] and the text is set out below. Under the law in English and Wales, you do not have a right to enter and remain on other people’s property. You have a ‘presumed right of entry’ to shops, public buildings, areas of “public space” in cities or roads that are actually owned privately, but this right can be removed. Under laws covering civil trespass, the owner or their representative can use reasonable force to remove you from the land or property to prevent damage to it or protect people’s safety, although they often will seek a possession order first from a civil court. They cannot use violence to secure entry onto ‘premises’ (which includes buildings, land around it or a site with a number of buildings). It is also an offence to trespass on some publicly owned land – for example, land managed by a local council, such as the grass verge beside a road. In 2014, East Riding of Yorkshire Council evicted an anti-fracking camp on a grass verge at Crawberry Hill near Beverley. Netpol believes it is possible to claim that you are legitimately using private land – against the wishes of the landowner or their representative – on several grounds, including to protest and to prevent crime. These grounds are relevant to anyone who faces criminal prosecution for activities carried out on private land and as larger areas of urban space become privately owned. This is why the conduct of private security guards have been particularly important in recent cases arising from anti-fracking protests, protests at housing estates and protests in shopping centres. Private security guards are commonly used by landowners and property owners to try to prevent protest and other unwanted activity on their land and in their buildings. 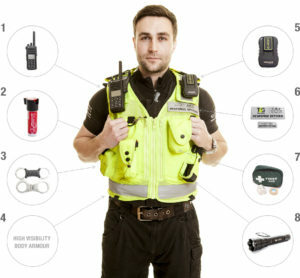 There is no standard uniforms worn by security guards but they are often almost indistinguishable from those worn by the police, as this promotional image for one company shows. However, private security guards do not have the same powers as police; in any attempt to remove or detain you, they must also call the police. Private security guards have no more legal power than any other member of the public (but see Community Safety Accreditation Schemes below). Like other members of the public, security guards can use ‘reasonable force’ to remove trespassers from private property, if they are acting as agents for the property owner. Private security can only detain someone if there is a risk of injury, damage to property or that the person is likely to escape before the police can take over responsibility. As most security guards are inadequately trained and unlikely to know the limits of their powers, they run the risk of acting unlawfully if they attempt to make a citizen’s arrest. What constitutes ‘reasonable’ force and ‘reasonable’ suspicion is open to interpretation. However, decisions made in court often suggest that the authorities allow security guards to act with more force than the average member of the public. ‘Reasonable force’ can include the use of handcuffs or other forms of restraint (a number of private security firms equip some staff with handcuffs and with specialist training in their use) However, they must exercise care in doing so or risk committing an assault, which you can lawfully resist. This has not stopped security personnel threatening to use handcuffs and using excessive force, for example against protesters outside Brighton arms manufacturer EDO MDM. When a confrontation with security guards occurs, it is also likely the police will step in to arrest protesters to ‘prevent a breach of the peace’ for refusing to leave private property, even if no other criminal offence has been committed. Breach of the peace means ‘actions that harm or threaten to harm a person, or harm their property in their presence’. It is not a criminal offence, and if you are arrested you must – in theory if not in practice – be released as soon as the threat of the breach has ended. In most cases, security guards that activists are likely to encounter are licensed by the Security Industry Authority (SIA), because they provide ‘manned guarding’ roles covered by the Private Security Industry Act 2001. This includes both security personnel at an outdoor protest site and also staff employed, for example, at shopping centres where your campaign might have a stall. Front-line staff (those on the ground who guard property or premises) must wear a credit-card-sized licence where it can be seen. Failure to do so is a breach of the licence conditions and may be reported to the SIA (see below). ‘Reasonable force’ is open to interpretation but it can mean restraint techniques and the use of handcuffs. Unlike private security, bailiffs (‘enforcement agents’) are employed by the county courts and high court enforcement officers usually work for private companies contracted by the High Courts. They have some powers when executing a warrant issued by the court to repossess a building or land, using reasonable force if necessary. It is an offence under the Tribunal, Courts & Enforcement Act 2007 to “intentionally obstruct a person lawfully acting as an enforcement agent”. The Courts Act 2003 places a duty on a police officer to assist enforcement agents (or “a person acting under the enforcement agent’s authority”) in the execution of a writ. 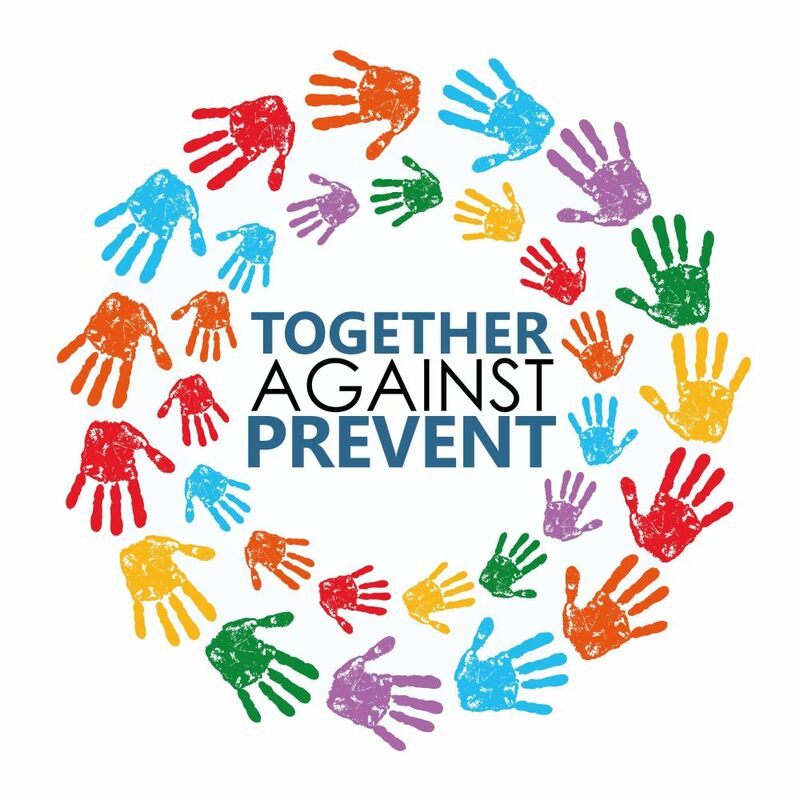 The Police Reform Act 2002 allows Chief Constables to accredit people working in security roles to receive limited powers under an approved ‘Community Safety Accreditation Scheme’ (CSAS) for “combatting crime and disorder, public nuisance and other forms of anti-social behaviour”. Accredited Persons must wear a uniform approved by the police when exercising their powers and carry an ID card that also shows the powers they are authorised to use. The logo above indicates a security guard is CSAS accredited. 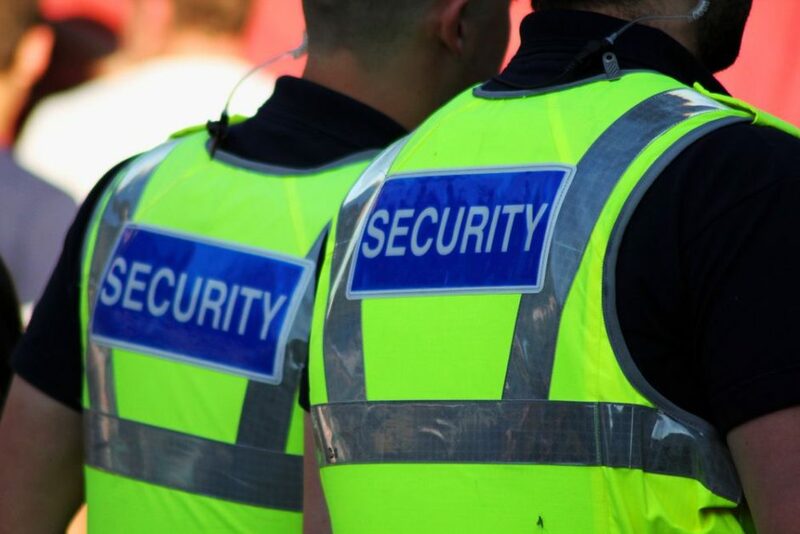 The Security Industry Authority is concerned primarily with security staff working without a licence, not with complaints about the conduct of individual guards. If you think a member of security staff is unlicensed or failing to display their license, you can complaint to the SIA. For details about making an online complaint, see: www.sia.homeoffice.gov.uk/Pages/enforcement-reporting.aspx. However, it is important to note that the SIA is a ‘self-regulatory’ industry body, and seems generally uninterested in taking action against companies whose guards act unlawfully. If you want to complain about the behaviour of a private security company employee, you need to write to the company asking for a copy of their complaints procedure. This can be difficult as guards have, in the past, refused to say which company they are working for, making it practically impossible to complain or report illegal behaviour. You can also complain to the police if you believe a security guard has acted unlawfully, including the use of excessive force without reasonable grounds (i.e., assault) or breach of the licensing regulations, such as failure to display a license. In some cases, police have taken (wrong) advice from security guards themselves about what is unlawful conduct. During the eviction of the Sweets Way housing estate in Barnet in 2015, a police sergeant told legal observers that an agreement between local police and security guards meant that they do not have to display their SIA licences and wearing numbered badges was sufficient. However, police also ignored complaints about unreasonable force during the evictions and with security personnel refusing to display identification or even say what company they worked for, it was impossible for protesters to seek redress. In similar circumstances to events at Sweets Way, the only route available is to take down the epaulette numbers of police officers who refuse to intervene and then make a formal complaint in writing to the Chief Constable. If you see the same security guards turning up week after week, it is a good idea to keep a log (including a record of video recordings) of incidents and any complaints made. In practice, the police will not usually act on these complaints. However, when individual security guards step over line and exceed their powers, it is useful to have this information in case you are arrested, particularly if it was not possible to document the specific incident. Private security companies who gather and process footage recorded by staff wearing headcams or body cameras are covered by the same SIA licensing that applies to CCTV operators, known as ‘public space surveillance’. As public space surveillance captures information about individuals and is held by organisations, it is covered by the Data Protection Act 1998. Organisations that gather, use and retain personal data must register as a data controller with the Information Commissioner’s Office. In practice, security guards often record protesters on their phones, simply as a form of intimidation. However, the firm they work for is still liable to properly secure and retain this data. If you think you have been under surveillance, you can apply to the security company to obtain a copy of data held about you. This known as a ‘data protection subject access request’. To make one, you still need to know the company the security personnel filming you are employed by. If you would like to make a subject access request to a private security company, please contact Netpol for assistance.